Earlier this year I travelled outside Ghana, and considered myself quite careful in my choice of accompanying reading material: two books, plus a Kindle, were what I carried with me. I figured that I wasn’t likely to be doing too much reading, because of what was going to happen to my eyes, but at least there would be something to read on the plane trips and at other times. So what did I chose? The first was an Accra Book Club choice: Geraldine Brooks, People of the book, which I thought I should read first since I was the one who suggested it in the first place, and I had chosen to “lead” or “facilitate” the discussion on this novel in June. Normally such a book would have taken me a week or less to read, but dealing with adjustments in eyes and reading glasses meant it took longer. The second book was Farida Bedwei’s semi-autobiographical novel, Definition of a miracle, which I had ordered through Amazon, after hearing it was published but not having seen any copies here in Ghana. Yet another case of jumping the gun, as of course it is now available here in Accra! Oh well, no harm done. The author should benefit – hopefully. An additional reason for reading this book was that Bedwei’s story was on a list for consideration as an Ashesi-wide read. I admit I enjoyed it, and found her portrayal of a girl with a handicap amusing and touching. Her handicaps were accepted as part of her life, yet the main character did lots of reading, and had friends. I was very glad I took my Kindle. I had bought it in 2010, and had downloaded a few items onto it, but hadn’t really, really used it. I am not sure why, but I suspect partly because I had/have so many physical books to read, that I didn’t really feel the need. 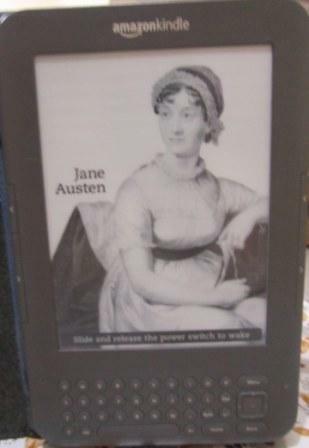 But somehow for travelling having the Kindle was very appropriate. And because my eyes were in transition, I really loved being able to increase the font size to compensate for my uneven eyes! And then to change it to whatever felt comfortable to me! The other great thing was being able to download books directly to the Kindle without the intermediary of my laptop. In Ghana I usually end up downloading books to my pc, and then push them to the Kindle – none of which is particularly arduous, I do admit! Am I a total convert to e-reading? No. Am I a fan? Definitely. Will I continue to read electronically and in physical formats? Oh yes.